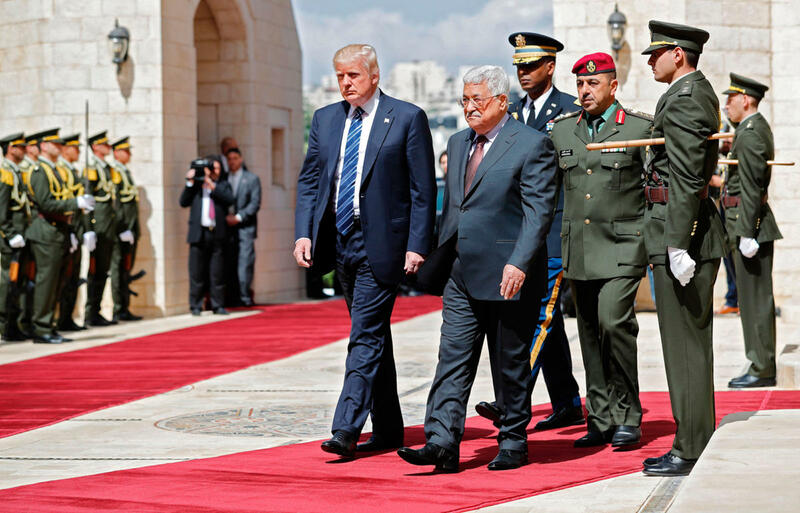 Donald Trump met Mahmoud Abbas, in Bethlehem today, a twofer for a President intent, as the national-security adviser, H. R. McMaster, put it last week, on visiting “homelands and holy sites” and expressing “his desire for dignity and self-determination for the Palestinians.” Reading prepared remarks, in a Presidential palace outfitted with the trappings of sovereignty, Trump told reporters that he’d work with Abbas on “unlocking the potential of the Palestinian economy.” Naftali Bennett, the Israeli education minister and a settlement advocate, probably spoke for most of Benjamin Netanyahu’s government last November, when he declared that, with Trump’s election, “the era of the Palestinian state is over.” Today, in Bethlehem, it was prolonged. Much has been written about the Trump Administration’s growing desire to conceive that state from the region in, rather than from the conflict out. Yesterday, in Riyadh, Trump reportedly agreed with Egyptian President Abdel Fattah el-Sisi to hold a peace summit, with Netanyahu, Abbas, and Jordanian and possibly even Saudi representatives in attendance. There is also much discussion about the vulnerability of Netanyahu’s government, due to the ongoing criminal investigations (he is accused of, among other things, enabling close associates to profit from Israel’s procurement of naval vessels) but also to the threat posed by coalition partners like Bennett’s Jewish Home Party, which would rather topple the government than accept concessions—particularly a prospective Palestinian capital in East Jerusalem—under U.S. pressure. But Palestinians have a politics, too, which usually gets only cursory attention. 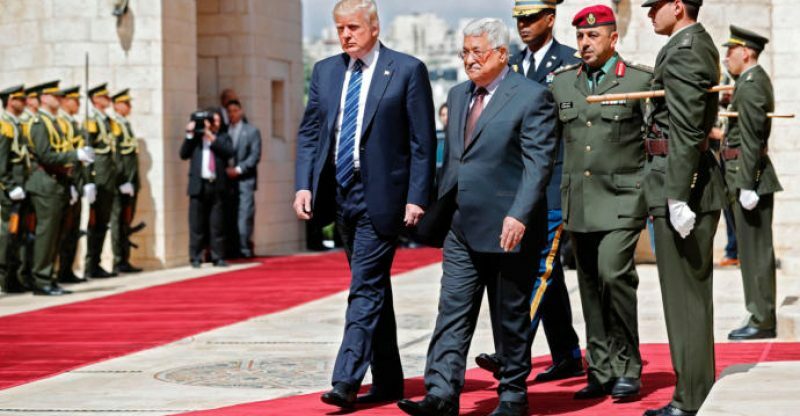 Abbas has an ongoing rivalry with Hamas, but other challenges besides; if the Trump Administration procrastinates, or expects significant new concessions from him, Abbas’s staying power is similarly uncertain. Abbas is eighty-two, with a smoking habit, and he has no designated successor. He is the head of the Fatah movement and was elected President of the Palestinian Authority in 2005. (As a Palestinian friend told me, Abbas is in his twelfth year of a four-year term.) He won with more than sixty per cent of the vote. Yet polls now show that more than sixty per cent of Palestinians want him gone. His achievements—two rounds of peace negotiations with Israel, first with Ehud Olmert, in 2008, then with Netanyahu, in 2014; securing non-member observer-state status for Palestine at the United Nations, and Palestinian standing with the International Criminal Court—are shadowed by suspicions that P.A. leaders engage, if only by necessity, in a form of collaboration that occasions financial corruption and undermines Palestinian honor. “Despite some shrewd diplomatic moves, the reality on the ground is bitter, muddled,” Sam Bahour, a prominent business consultant in Ramallah, told me. Ordinary Palestinians resent what they see as a “defunct political system, no parliamentary elections since January, 2006, and police brutality, especially against Hamas supporters.” Some P.A. officials have managed the flow of aid to monopolistic enterprises that provide perks and inflated salaries to friends and family—reportedly including Abbas’s son. According to the Times of London, European Union auditors can’t account for nearly two billion pounds in aid distributed between 2008 and 2012. But the World Bank reports that about thirty per cent of Palestinians are categorized as unemployed, and youth unemployment in Gaza is nearly sixty per cent. Abbas has also appeared powerless to prevent new Israeli settlements, military aggression, and the siege on Gaza. Meanwhile, the recent meetings with Trump have given Abbas a boost. During his visit to the White House, earlier this month, he reportedly proposed restarting negotiations with Israel where he and Olmert left off, in 2008. Those negotiations covered most major issues—security, borders, Jerusalem, and refugees—and both leaders considered the remaining gaps bridgeable. He is also turning up the heat on Hamas in Gaza, in an effort to force a genuine reunification—an action that may backfire, as Gazans are suffering in the process. Abbas has, for example, insisted that Hamas, not the P.A., pay the taxes due to Israel for the fuel that runs Gaza’s only power plant; Gazan homes currently get barely four hours of electricity a day. But, to fully regain its moral prestige, Fatah needs the promise of charismatic leadership, and Abbas’s old rival in the movement, Marwan Barghouti, is turning up the heat on him. Barghouti has been held in Israeli prison since 2002, for murder and terror crimes, but before that he was an open advocate for the 1993 Oslo Accords. Khalil Shikaki says that Barghouti is the most popular leader in the Palestinian territories, acceptable to both Fatah and Hamas supporters, in part because he has remained defiant in prison. Last month, Barghouti organized a hunger strike of more than fifteen hundred high-security prisoners, whose goals he outlined in an Op-Ed for the Times. They are calling for, among other concessions, more phone calls and visits with family members. Abbas has no choice but to support the strike, but, if Barghouti wins more open paths of communication, he will be better positioned to challenge Abbas for the Presidency, even from prison. Israel’s efforts to break the strike, including the release of a video showing Barghouti desperately sneaking a candy bar, prompted his wife, Fadwa, to declare that they would “only strengthen the prisoners’ resolve.” Seven hundred prisoners are still on strike. If they begin to die—or, more likely, if they are force-fed—West Bank streets are likely to be roiled by demonstrations. (Rioting broke out on Friday, leaving thirty people injured.) It is hard not to see Barghouti’s strike as a campaign to revive Fatah’s reputation for insurgency, while positioning himself as the movement’s natural heir. Barghouti is not Abbas’s only challenger, however. More conventional rivals have emerged, especially since Fatah held its seventh congress, last December, in Ramallah. Jibril Rajoub, a former guerrilla who was himself imprisoned in the nineteen-eighties, placed second to Barghouti in elections to Fatah’s executive committee. Rajoub is now the head of Palestine’s branch of FIFA—international soccer’s governing body—and has campaigned to have Israeli settlement teams expelled from the association. The P.A.’s intelligence chief, Majid Faraj, has met with Mike Pompeo, the new C.I.A. director, to discuss the P.A.’s coördination with the Israeli military. The P.A. can’t hold new Presidential and parliamentary elections while Gaza and the West Bank remain divided, but the aging Fatah leadership might nevertheless try to reëstablish its legitimacy—to “rebrand” the P.A., as one official put it to me—by rebuilding the National Council, the legislative body of the Palestine Liberation Organization, as well as absorbing Hamas as a political party and forming a new executive committee of that organization, which would be led by a new Fatah chairman and P.A. technocrats. Israeli rightists, by contrast, seem perversely contented with the thought that the P.A. would collapse if Abbas exits. The Likud environmental minister, Ze’ev Elkin, said, “The P.A. was born with Abu Mazen”—Abbas’s nickname—“and the P.A. will disappear with Abu Mazen.” Despite the many problems, however, collapse seems improbable. After twelve years of Abbas, the P.A. is a state apparatus in the making, whose resilience should not be obscured by the ups and downs of peacemaking. The P.A. directly employs more than a hundred and fifty thousand people—police, teachers, office workers. 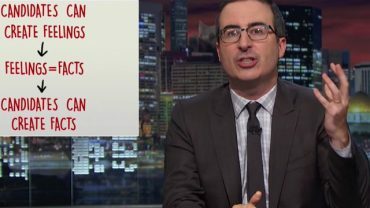 Its officials anticipate an eight-hundred-million-dollar shortfall in this fiscal year, yet the G.D.P. in the Palestinian territories doubled from 2008 to 2016, to about eight billion dollars—the growth managed by economists trained in the U.S. Palestinian universities graduate more than a thousand computer-science specialists a year. Ariel Ezrahi, the director of infrastructure in the Office of the Quartet, the international body set up in 2002 to aid Palestinian development, told me that the P.A. has worked “persistently and constructively” with Israel and international sponsors to gain independent sources of power generation. A new power plant is projected for Jenin, as is a gas pipeline to generate electricity in Gaza. The six-billion-dollar private sector is more obviously resilient. Banks chartered by the Palestine Monetary Authority have net assets of more than thirteen billion dollars. Palestine has a billion-dollar telecommunications sector, a half-billion-dollar stone-and-marble industry, and prime contractors active in Israel’s furniture and food-processing supply chains. Rawabi, a planned city expected to house forty thousand residents, is rising, north of Ramallah; its growth will be driven by a high-tech core, with branch plants of international software companies. Israel’s Mellanox Technologies is already committed, Bashar Masri, the C.E.O. of the Rawabi development, told me.